Newburgh are back in numbers to cut out this attack. Newburgh were on their travels, making the trip to Armadale for the first time in the South Premier League. The visitors started the game well and were rewarded for their efforts with a goal on the fourth minute through Lambert who made no mistake from close range. Armadale dragged themselves back into the game and began to cause the ‘Burgh defence problems. Johal and Skinner were called into action to thwart the home side’s attacks. 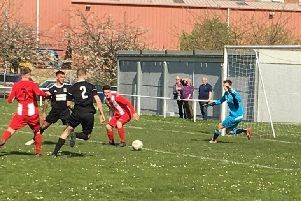 It was just after the half hour when Armadale deservedly equalised a free kick from just outside the box was well saved by Sutherland low to his left, the ball was not cleared from the save and Allison pounced. As the half was ending Armadale took the lead with a Gray free kick perfectly placed in the top corner. The half time team talk seemed to stimulate the ‘Burgh with a succession of chances going a begging just after the re-start. Newburgh looked likely to equalise as their pressure began to tell on the home defence. Chances fell to Sutherland and Hughes who both struggled to capitalise. Armadale increased their lead on the 69th minute when Robertson latched on to a through ball from midfield. Newburgh, who had been pushing up the park were caught out and Robertson found time and space to pick his spot giving the home side the all important two goal lead. With Newburgh chasing the game Armadale were finding space to break out. Allison and Robertson both grabbed another goal apiece in the last five minutes to put the game well out of Newburgh’s reach. Newburgh travel to Aberdeen next weekend for a Scottish Junior cup tie against North Super League outfit Hermes. Newburgh: C Sutherland. Johal, Clark, Meaney, Skinner, Lambert, Wright, Smart (F Robinson 69),MacBride (C Robinson 65), S Sutherland, Hughes (Gay 61).